I first became aware of Margaret Atwood 17 years ago, when, for some reason, a Canadian professor came to teach at my school. We were fresh-faced 16-year-olds, accustomed to the study of Shakespeare and the classics of American literature. We were used to Scout Finch and Boo Radley, Katherine and Petruchio; we had once inexplicably been forced to read Three Men in a Boat. We had never read anything like The Handmaid’s Tale. The book has stayed with me, both physically and emotionally, ever since. I talk about it at least once a day. In a perfect storm of events, I chose to teach it this year before discovering the entire class comprised of girls. I’ve read The Handmaid’s Tale every couple of years since studying it, always finding something new to be traumatized by. It’s fair to say that I am somewhat obsessed with Atwood and her work. So when I discovered that she was speaking at a nearby literary festival, I had to be there. Having promised to procure tickets for two like-minded friends, I was all set to finally meet my idol. Then I forgot to buy the tickets. Weirdly, the event sold out. Luckily for me, Atwood is both prolific and happy to travel, and so I was again provided with an opportunity to see her in October and, having learned a valuable lesson about trusting myself to do important things, I bought tickets straightaway. Which is how I came to be at the Theatre Royal in the beautiful city of York–incidentally, home of my alma mater–to hear Atwood speak about her latest novel, Hag-Seed: part of the Hogarth Shakespeare series, for which assorted contemporary authors have adapted the Bard’s plays into modern novels. On the subject of the event’s location, incidentally, Atwood mused that she hadn’t been in York since 1963, concluding, “It’s a great pleasure to see it’s still standing.” Hag-Seed takes on The Tempest, translating the play’s magical island into a men’s prison, where disgraced theatre director Felix plots revenge on those who destroyed his career. Atwood was unexpectedly hilarious in discussing the foundations of her retelling. 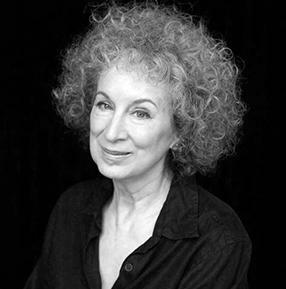 Approached by the publishers to contribute to the series, she admitted she was “not too sure what the aim was,” aside from it being a 400th anniversary; although, as she mused, “they didn’t tell me of what.” Recognizing Shakespeare’s use of his own experience in creating Prospero, Atwood wanted to stay as close as possible to the original work; it’s something she does extraordinarily successfully, adeptly balancing the need to use recognizable characters and situations while producing something original and worthwhile. Hag-Seed features a number of prisons, both real and metaphorical, and, within the novel itself, there is reflection on the range of incarcerations evident in The Tempest; as with Shakespeare’s work, the novel juxtaposes grit and realism with serendipitous coincidence, with the prison proving an unexpectedly high level of freedom through which Felix can exact his revenge. While the novel focuses on grand themes, Atwood also contemplated the logistics generally ignored by Shakespeare; she pointed out, for example, that Prospero never takes a bath, presumably fearing that Caliban would murder him once the magical robe was removed. Equally irreverently, she mused that, having known little else but island life, “Miranda doesn’t realize there’s a place with better food and it’s called Milan.” The diet of Shakespeare’s island-dwellers and shipwreck victims, she said, can be summed up as “no butter, no dairy, no gluten; it’s very gluten-free.” Asked her view on current political events (the event took place in the build-up to the US presidential election), Atwood dramatically put her head in her hands and pleaded, “Oh, let’s not talk about that” and remarked on a question about the future with a wry smile, saying “I’m gonna be dead but you probably won’t be.” Atwood’s novels are littered with acerbic humor and the darkest of one-liners, and it’s clear that her own humor is visible here; I’ve been to a number of comedy shows which produced fewer laughs than she did. My entertainment levels only increased once I realiZed why her deep, slow drawl appealed to me so much: am I the first person to notice that Margaret Atwood sounds like a female Iggy Pop? Can someone please put them in a room together and record the conversation for me to listen to in times of crisis? Moving on from Hag-Seed, Atwood discussed other projects, including her involvement in the Future Library initiative; one writer each year will contribute a text to the library until 2114, when the forest that has been planted in Norway for the purpose will be used to publish the works. Atwood described the Future Library as “a very hopeful project,” and, more amusingly, “like Sleeping Beauty.” She told an interesting anecdote about longing to be asked what was in her luggage by a Norwegian customs official and being able to enigmatically reply, “I can’t tell you.” On the subject of her formative experiences of writing, Atwood told of taking a creative writing course in 1961–“you could take it but you didn’t get a mark for it”–and the lack of interest in the arts in the late 1950s that allowed her to develop skill in so many different styles of writing; “if you did them, you did them all,” to trick people into thinking there were more people contributing. On the process of writing Hag-Seed, Atwood uttered my favorite line of the evening; her process was, in her words, a combination of “rash commitment followed by procrastination and panic.” This is what I am going to call my autobiography. This was one of the most profoundly English-teacher-y events I’ve ever been to, only emphasized by the questioner at the end who asked Atwood to explain the 3rd epigram at the beginning of The Handmaid’s Tale for her class (at this, my colleague and I turned to each other and instantly quoted that particular Sufi proverb–the English teacher equivalent of singing along to your favorite song at a gig), and Atwood herself gave away an idea beloved of my profession when she mentioned an online Shakespearean insult generator. I go to gigs these days and feel old; I go to listen to Margaret Atwood and I feel at home. Despite the discomfort inspired by so much of her subject matter, being in her presence (albeit at a nosebleed-inducing height in the gallery) was infinitely comforting. In works like the Maddaddam trilogy and her environmentally-themed graphic novel, Angel Catbird, Atwood continues to draw our attention to the pressing issues of our time and inspire action. 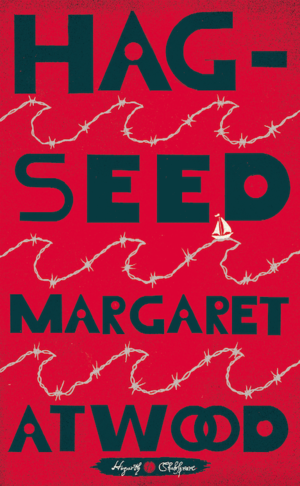 While Hag-Seed represents a change from the speculative fiction for which she is best known, it’s well worth reading, both as an excellent adaptation of The Tempest and a riotously entertaining novel in its own right. While a good understanding of the original play certainly illuminates a reading of Hag-Seed, it’s by no means essential in enjoying Atwood’s complex and nuanced characters, as well as her passion for literature as a healing force. I read it after attending the event and its quality was only enhanced by my brain choosing to read it in its own version of the Atwood/Iggy Pop drawl.